Mick Jagger has already tweeted a photo of himself at the festival with his yurt. THIS COULD BE the last time, as Mick Jagger once sang. For the Rolling Stones, it’s definitely a first. The veteran rock rabble-rousers play Britain’s Glastonbury Festival tonight, their debut appearance at the country’s most prestigious rock music event. Many of the 135,000 festival ticket-holders are expected to cram the space in front of the Pyramid Stage for the gig. Jagger, who turns 70 in July, also gave no clue about whether the band he started with Keith Richards in 1962 will ever call it quits. He said, “I’ve no idea,” before telling an interviewer that he’d probably continue as long as he was wanted. The band recently played a string of North American dates on its 50 and Counting tour and is due to play two concerts in London’s Hyde Park next month. The Stones turned down offers to play Glastonbury for years, but appear to have embraced the down-to-earth spirit of the festival, held on a farm in southwest England. On Saturday Jagger tweeted a picture of himself outside a yurt, a Mongolian-style felt tent where he reportedly spent the night. “I look upon it as a culmination of our British heritage really,” he said. It had to be done and it’s going to be done, and we’ll see what happens, you know. The Glastonbury Festival was founded by Michael Eavis in 1970 on his Worthy Farm near Pilton, 193 kilometers southwest of London. It is famous for its eclectic lineup — and the mud that overwhelms the site in rainy years. Other performers on Saturday include Elvis Costello and Primal Scream. The three-day festival wraps up Sunday with a headlining set from Mumford & Sons. 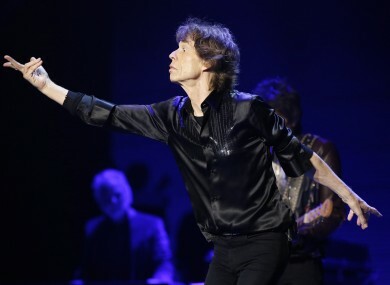 Email “Like a Rolling Stone: Mick Jagger and co to play Glastonbury tonight for first time”. Feedback on “Like a Rolling Stone: Mick Jagger and co to play Glastonbury tonight for first time”.